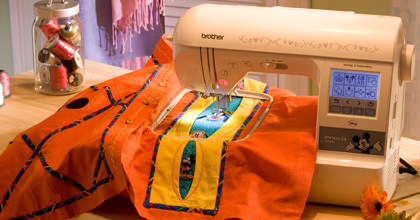 The Brother Innov-ís 1250D combination sewing and embroidery machine is a remarkably affordable model that now includes 35 built in Disney® character designs. The 5" x 7" embroidery hoop gives you plenty of room to decorate your jeans, embellish a pillow or personalize your gifts with embroidery or monogramming. Simply touch the monochrome LCD screen to choose sewing stitches, embroidery patterns, help screens and more to explore your creative possibilities. Use the USB port to easily import designs from your USB memory stick. The 7-point feed dogs give you smooth, even stitches on almost any fabric. Features such as the Quick-Set™ bobbin, advanced needle threading system and super easy bobbin winding system make sewing a joy.